Megatrends such as rapid urbanization and globalization significantly impacted the society through the ever-increasing movement of people and cargo across the globe. The airport operators face major challenge of efficient accommodation of escalating passenger and cargo traffic. In addition to this, guaranteeing the complete safety and security of passengers, airport assets, staff and infrastructure remains key at all times which forces airport authorities to adopt and implement sufficient and advanced security solutions. Moreover, airports are faces major security threats, including terrorism, unauthorized entry, theft and vandalism, which are the major factors for the growth of airport security solutions market growth across the globe. Goldstein Research analyst forecast the global airport security solutions market to expand at a CAGR of 5.1% during the forecast period 2016-2024. Further, the market is anticipated to reach USD 12.9 billion by the end of forecast period owing to growing air passenger traffic and rising threat of terrorism and criminal activities at airports. The report covers the present ground scenario and the future growth prospects of the airport security solutions market for 2016-2024 along with the total revenue of airport security solutions market in every region. We calculated the market size and revenue share on the basis of revenue generated per segment, regional and country level. The revenue forecast is given on the basis of number of airport security solutions companies and current growth rate of the market. Based on technology type, surveillance systems are expected to hold the lion share of the global market throughout the forecast period. Over the forecast period, however, cyber security spending will rise significantly and the segment is likely to grow at fastest pace. 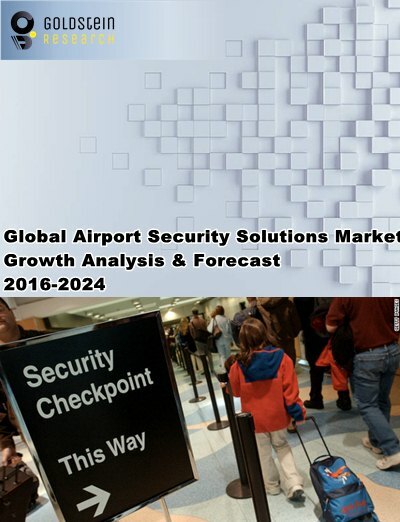 Global Airport Security Solutions Market Outlook 2016-2024, has been prepared based on an in-depth market analysis from industry experts. The report covers the competitive landscape and current position of major players in the global airport security solutions market. The report also includes porter’s five force model, SWOT analysis, company profiling, business strategies of market players and their business models. Global airport security solutions market report also recognizes value chain analysis to understand the cost differentiation to provide competitive advantage to the existing and new entry players. According to our global airport security solutions market study on the basis of extensive primary and secondary research, one major trend in the market is emergence of IoT (Internet of Things) and technological advancements. Many large international airports have adopted advanced technology. For instance, the self-service check-in kiosk systems installed at the London Heathrow Airport not only improve passenger travelling experience but also to expedite the screening process. According to the report, major driver in global airport security solutions market is growing air passenger and cargo traffic across the globe, which has significantly augmented the need for efficient airport security systems. Globally two thirds of airports have planned major developments in airport security solutions and IT expenditure is likely to be the top priority by airport operators. Further, the report states that one challenge in global airport security solutions market is initial high capital investments and the maintenance cost of smart devices and services expected to hinder the market growth. Geographically, North America accounted for the largest market share with 35% revenue in global airport security solutions market. Asia Pacific is anticipated to be the fastest growing region for airport security solutions market, at a CAGR of +9% during the forecast period attribute to the fastest growing economies in the region and rapidly growing air passenger traffic. Middle East & Africa are the most opportunistic regions owing to growth of tourism industry and reimbursement projects for older airports in the region. What is the total market size of airport security solutions market by 2024 and what would be the expected growth rate of the market?